Make the right choice for your new floors when you visit the showroom at The Floor Trader of Colorado Springs. At our store, we feature a full collection of waterproof floors in Colorado Springs, CO. We proudly offer materials that are the perfect fit for any room in a home. Whether you are focusing on your kitchen, bathroom, or another area, you are sure to find a pattern and material you love when you shop with us. We invite you to discover how easy it can be to transform your space with products from some of the leading names in the industry today. Visit our local showroom today to discover your options in waterproof flooring. You deserve to live in a home that you are proud to call your own. When you turn to us for our water-resistant carpet and vinyl, you will add beauty to your space. 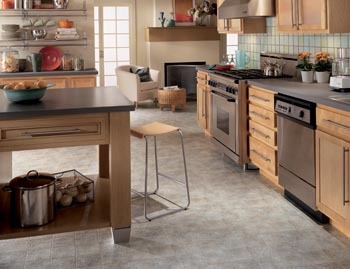 With our selection of flooring, every part of your home will stand out for the right reasons. Choose products from top names with a visit to our showroom. Our collection of products includes flooring from trusted manufacturers. Enjoy your free time without stressing over having to care for your floors. With our waterproof flooring, you will update your home with a look that lasts for years to come. Water-resistant carpet and vinyl allow homeowners to create a new atmosphere that holds up to heavy use without developing damage. How does waterproof flooring work? This material is crafted in layers, making it a durable option that holds up to any type of spill. Whether you knock over a drink or your pet has frequent accidents, you can trust that these floors will continue to look great. Liquid does not soak through to the subfloor, and all it takes is a quick wipe to eliminate the mess before damage can occur. Dreaming of a soft and inviting atmosphere in your home? Whether you prefer a classic or contemporary style, you will find the ideal option with our collection of water-resistant carpet. Our friendly and knowledgeable sales professionals are happy to work with you to choose a product for your space. We discuss your wants, needs, and budget requirements, and we use this information to recommend the right material for your space. Once you find the perfect option, work with us to finish the job. Our contractors proudly offer complete waterproof flooring installation services. Contact us in Colorado Springs, Colorado, to shop at our showroom for waterproof floors. Our product selection is available for customers throughout Monument, Palmer Lake, and Security-Widefield, as well as surrounding areas.